Raptor 3/6 DVH - This group of tools evolved from our Raptor DVH end mills designed for high temperature alloy machining in materials such as Stainless Steel & Titanium. As you know, these softer gummy materials are often considered "difficult to machine" because of material buildup and and thermal expansion rates (material memory). We designed this for getting superior finishes in those materials. The DVH, Double Variable Helix, design is unique to Destiny Tool. What make the 3/6 different form the DVH? It's the applications! The 3/6 is designed for profiling but not for slotting. It's a profiling / finishing end mill! Similar to a double edge razor blade, the first flute edge takes the heaviest cut followed by a lighter chip load cut with the trailing edge. This variation in chip load leas to a superior finish in profiling applications. It's a VERY UNIQUE TOOL!!! What's a Double Variable Helix? A typical variable helix end mill consists of unequal flute spacing at various points along the cutting edge of the tool. The unequal flute spacing dampens vibration that is generated by the milling process. To further dampen the vibration, and dramatically reduce the harmonics that cause chatter in the workpiece, Destiny's DVH end mills have taken the next step in the design: EACH INDIVIDUAL FLUTE has a helix that varies! 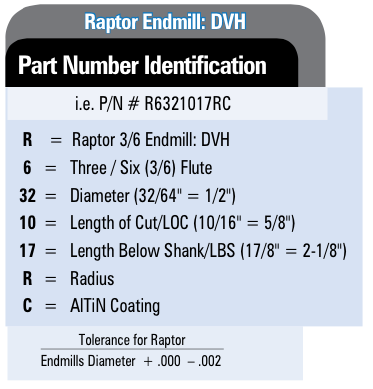 As a result, our unique designs in both our Raptor 3/6 DVH not only provides exceptional material removal rates and chip evacuation but most of the heat is removed with the chip! We induce less heat in the base material which translates into better finish, faster part production AND longer tool life "in-the-cut". And, of course, we break up the harmonics so you have superior finishes even in your 'roughing' operations! Helix: ~ 38 degrees, but each flute is different from the other; Each flute's helix also varies as depth of cut is increased. Diameter Tolerance: -0.000" to -0.002"
Shank Diameter Tolerance: +0.000" to -0.0003"
**LBS - Length Below Shank - This is measured from the tip of the cutting edged to the full diameter of the shank that engages in the toolholder. Typically, it is equal to or less than the cutting diameter. *Shank Necked Diameter - This is the reduced neck diameter of the shank to prohibit rubbing of the shank along the wall in a deep pocket milling application.